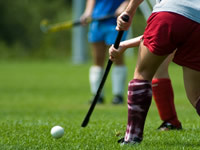 Hockey is a popular sport that requires a substantial amount of exercise, but can be very successfully managed by people with diabetes. Its pace is similar to games of football and rugby. Light to moderate intensity is involved, depending on how frequently you play and what your role is on the team. Many professional hockey players with diabetes have established medication routines which enable them to perform without worrying about their blood sugar levels. There are two particular variables to consider when managing your diabetes for playing hockey; how much energy you expect to use and the time of day in which you play. Midfielders generally exert much more energy due to the demanding role of simultaneously defending and attacking. Playing in goal, however, will be much less taxing, while centre and defence positions are focused on attack and defence respectively. If you have diabetes and play midfield then you should expect to manage your diabetes more vigilantly given the enhanced likelihood in which hypoglycemia can develop. Rolling substitutions can also influence your involvement. If you know you are going to be playing a full game, a sugar top-up will be required during the game. However, playing less due to substitution will not require this. A big meal should be consumed between two and three hours before training or a game, and a reduced dose of quick acting insulin can be given by around 25 per cent. This time frame will allow the insulin to have worked thoroughly with limited effects on your blood sugar as a result while playing. Morning or early afternoon games will require another big meal after the game to prevent a hypo later in the night. This could again be accounted for with a reduced insulin dose. The policy of big meals before and after sessions should still be followed for evening games or training, but you could consider reducing your long lasting insulin on the night. This can be discussed with your doctor prior to playing. This may work for casual players, but regular players may find that they do not have to adjust their long lasting insulin either before or on the day of playing. Blood testing should be done frequently on match days, especially if you are looking to establish a routine. Testing before, during and after matches will be required, as well as later in the evening when your blood sugar is prone to dropping. You should remember to take special care of your feet when exercising. Your choice of hockey footwear should be comfortable throughout. Playing regular hockey will require consistent foot care. It is best to learn how to play hockey without your insulin pump, as damage can be done to the device given the nature of the sport. Pumps can sometimes break upon contact with a stick or a ball. Some players, particularly young ones, may find it easier at first to wear their pump to establish a routine in which they can then learn to play without it. Managing BGs on race day? Sports with diabetes type 1?